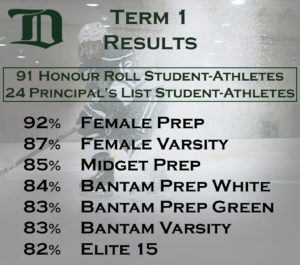 Our integrated school model provides student-athletes with the tools to succeed both on the ice and in the classroom. Each grade level has dedicated classroom time at the rink with teachers working on-site in our two classrooms: the Collaboration Room and the Focus Room. The Student Lounge is a flexible space where students can study between practice, workout and class. 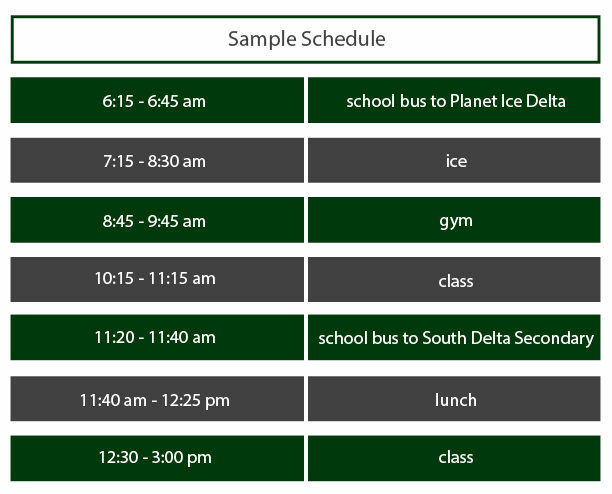 When the morning schedule is complete at Planet Ice Delta, bus transportation is organized to take students to South Delta Secondary School for the remainder of their classes in the afternoon. South Delta Secondary is a comprehensive, public high school that enrols approximately 1,500 students in grades 8 through 12 with a staff of approximately 110 professionals and support staff. South Delta Secondary School is accredited by the Ministry of Education – Government of British Columbia. 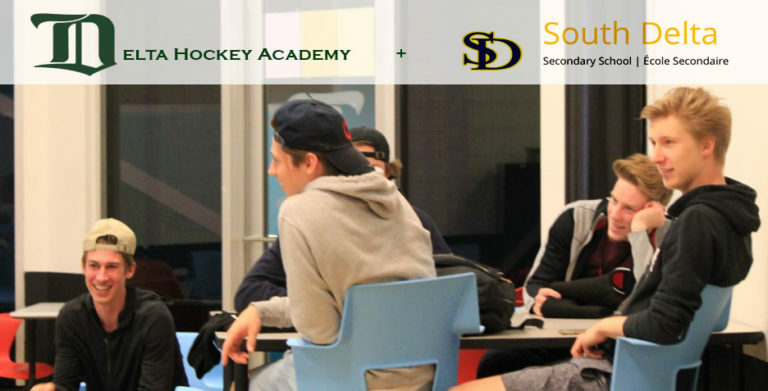 The academic program is organized on a Day 1/Day 2 alternating timetable with two daily schedules Monday to Friday from 7:15 am – 2:50 pm for all Delta Hockey Academy student-athletes. SDSS offers the following AP courses: Chemistry, English Literature and Composition, Psychology, Environmental Science. AP courses require application for enrolment to the subject area. Pre-AP classes are offered in English 10, English 11, Chemistry 11 and Physics 11. Entry into these courses requires an 80% prerequisite proficiency score and a teacher recommendation. The Math Challenge Program (Enriched and Accelerated) is offered in Foundations and PreCalculus 10 and PreCalculus 11. Entry into these courses requires an 80% prerequisite proficiency score and a teacher recommendation. World language courses include French Immersion, French and Spanish from basic through advanced levels. A wide variety of elective courses are offered in business, music, art, theatre, physical education, technology education, fine arts, languages and home economics. South Delta Secondary offers Career Education Programs in the areas of Career Preparation (Work Experience), Training in the Trades (Industry training) and Youth Work in Trades (Trade Apprenticeships). Aside from the Delta Hockey Academy, nine other Sport and Fine Arts Academy Programs are offered by the Delta School District and are credited courses scheduled within the school day.